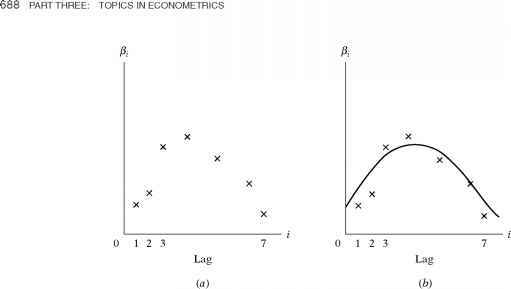 Although used extensively in practice, the Koyck distributed-lag model is based on the assumption that the ft coefficients decline geometrically as the lag lengthens (see Figure 17.5). This assumption may be too restrictive in some situations. 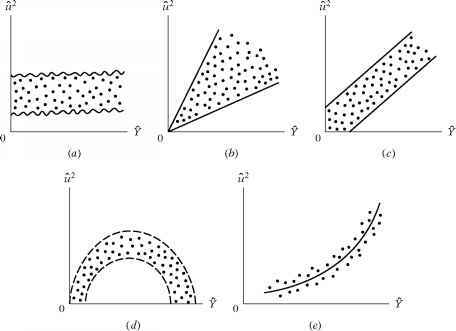 Consider, for example, Figure 17.7. 48Shirley Almon, "The Distributed Lag between Capital Appropriations and Expenditures,' Econometrica, vol. 33, January 1965, pp. 178-196. 49Broadly speaking, the theorem states that on a finite closed interval any continuous function may be approximated uniformly by a polynomial of a suitable degree. which is an mth-degree polynomial in i. 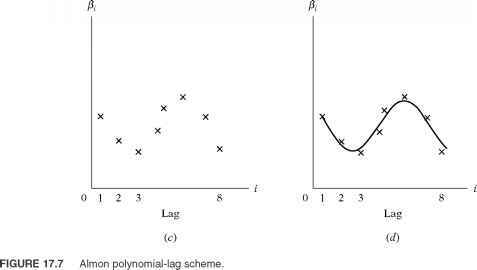 It is assumed that m (the degree of the polynomial) is less than k (the maximum length of the lag). In the Almon scheme Y is regressed on the constructed variables Z, not the original X variables. Note that (17.13.7) can be estimated by the usual OLS procedure. The estimates of a and ai thus obtained will have all the desirable statistical properties provided the stochastic disturbance term u satisfies the assumptions of the classical linear regression model. In this respect, the Almon technique has a distinct advantage over the Koyck method because, as we have seen, the latter has some serious estimation problems that result from the presence of the stochastic explanatory variable Yt— 1 and its likely correlation with the disturbance term. Before we apply the Almon technique, we must resolve the following practical problems. This advice is in the spirit of Hendry's top-down approach discussed in Chapter 13. Remember that if there is some "true" lag length, choosing fewer lags will lead to the "omission of relevant variable bias,'' whose consequences, as we saw in Chapter 13, can be very serious. On the other hand, choosing more lags than necessary will lead to the "inclusion of irrelevant variable bias,'' whose consequences are less serious; the coefficients can be consistently estimated by OLS, although their variances may be less efficient. One can use the Akaike or Schwarz information criterion discussed in Chapter 13 to choose the appropriate lag length. These criteria can also be used to discuss the appropriate degree of the polynomial in addition to the discussion in point 2. 2. Having specified k, we must also specify the degree of the polynomial m. Generally, the degree of the polynomial should be at least one more than the number of turning points in the curve relating fai to i. Thus, in Figure 17.7a there is only one turning point; hence a second-degree polynomial will be a good approximation. In Figure 17.7c there are two turning points; hence a third-degree polynomial will provide a good approximation. A priori, however, one may not know the number of turning points, and therefore, the choice of m is largely subjective. However, theory may suggest a particular shape in some cases. In practice, one hopes that a fairly low-degree polynomial (say, m = 2 or 3) will give good results. Having chosen a particular value of m, if we want to find out whether a higher-degree polynomial will give a better fit, we can proceed as follows. 50Russell Davidson and James G. MacKinnon, Estimation and Inference in Econometrics, Oxford University Press, New York, 1993, pp. 675-676.
where Z3t = Ek=0 i3Xt-i. After running regression (17.13.9), if we find that a2 is statistically significant but a3 is not, we may assume that the second-degree polynomial provides a reasonably good approximation. However, we must beware of the problem of multicollinearity, which is likely to arise because of the way the Z's are constructed from the X's, as shown in (17.13.6) [see also (17.13.10)]. As shown in Chapter 10, in cases of serious multicollinearity, a3 may turn out to be statistically insignificant, not because the true a3 is zero, but simply because the sample at hand does not allow us to assess the separate impact of Z3 on Y. Therefore, in our illustration, before we accept the conclusion that the third-degree polynomial is not the correct choice, we must make sure that the multicollinearity problem is not serious enough, which can be done by applying the techniques discussed in Chapter 10. What is the different distinct advantage of almon technique over the koyck method? Why shirley almon appriach is used? 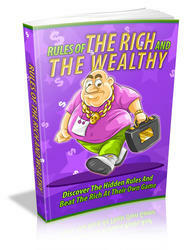 When to use the almon model or the koyck model?